Perhaps it is in the wake of the NSA revelations, but according to the NextWeb, the Indian Government is planning to ban the use of email services such as Yahoo, Gmail, for official communications. I have no idea whether that would serve to protect emails, but I am amazed if in fact official communications are supposed to be sent via Yahoo etc. Or to turn this on its head, there have been cases in the UK where public officials have used Yahoo, Gmail, etc. and the allegations have been that they specifically used these to avoid having their official emails open to public scrutiny. Would you send a greeting card with this photo? 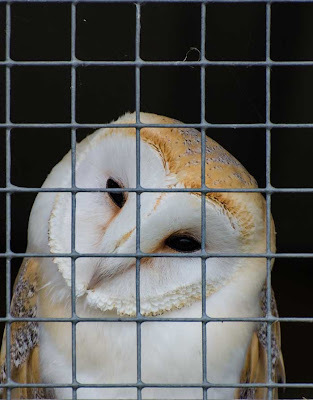 We haven't used this photo in a card because the owl is behind wire in a cage. It doesn't spend all of its time in the cage and it probably has a good life, but it is a sad-looking photo, isn't it? If this was the photo on a greeting card, do you think it is too sad to send or is it something you might send? My wife Tamara calls Quillcards "the orphan child" because it gets left behind with all the work we have been doing recently on Pelican Cards. Well today we made a new logo with the word Quillcards to grace the main site at Quillcards. On the blog we've been using the Thesis framework for a couple of years, and we were going to update to Thesis 2. But... we think it's a bit of a pig to work with and that the Genesis framework from StudioPress is much more pleasant to use. So when StudioPress brought out the Beautiful Pro child theme recently, we decided to use it.